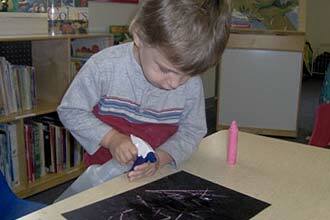 Preschool is a busy, fun place for growing and learning. Children who are 3 years of age on or before August 1 may participate in our preschool program. We offer preschool classes 3, 4, or 5 mornings each week during the school year from 8:15a.m. until 11:30a.m. We also offer child care for 3-year-olds before and after preschool (All children in our child care program also participate in our preschool classes). All New Pathways’ preschool teachers have a B.S. degree (or higher) in early childhood education, elementary education or a related area of education. Our Preschool curriculum is based on the Foundations to the Indiana Academic Standards for Young Children. Our teachers plan daily experiences and learning activities in literacy, math, science, social studies, and the arts. 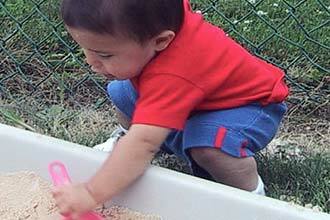 We support and encourage your preschooler’s physical, social, and language development. Our bright, clean preschool classrooms are carefully arranged with centers for learning. Each of our preschool classrooms includes a center for Blocks, Dramatic Play, Literacy, Math, Science, Art, Writing, Sand and Water Play, and Computers. New Pathways’ safe, fenced outdoor playground is a favorite place for our preschoolers! Children enjoy riding bikes, climbing and sliding, playing in sand, planting vegetables in the garden, and exploring nature. Families are important at New Pathways. Each week, parents receive a written calendar with details about the learning activities that are planned, dates for upcoming events, and classroom announcements. We offer parent-teacher conferences in the spring and fall and our teachers also provide parents with written progress reports. We invite you and you child to visit one of our preschool classrooms today!